Contract farming has received renewed attention recently as developing economies try to grapple with how to transform the agricultural sector and its associated value chains. 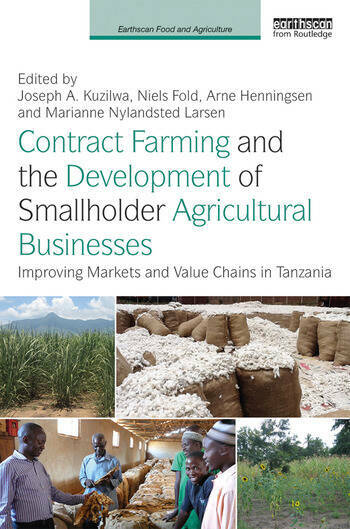 This book examines different contract arrangements for selected crops, applying both qualitative and quantitative approaches in order to examine how contract farming affects smallholders and value chain dynamics in Tanzania. Major themes covered in the book include: contract farming policy; contract farming and value chain dynamics; contract farming adoption decisions; contract farming and income diversification. The authors also discuss alternative aspects of contract farming such as trust, conspiracy, empowerment and corporate social responsibility. The book presents original research from case studies conducted in Tanzania on sugarcane, tobacco, sunflower and cotton. These crops have a history of trials and errors with contract farming involving smallholders. Furthermore, they are targeted in national strategies as some of the main crops for establishment and upgrading of agro-industrial activities in Tanzania. 5. Successes and Barriers regarding small and medium-size enterprises (SMEs) in the value chain for sunflower in Tanzania: Does contract farming reduce value chain coordination problems for SMEs? 8. Tobacco contract farming in the Urambo District of Tanzania: Which farmers obtain inputs on credit and which buy them for cash? Joseph A. Kuzilwa is a Professor in the Department of Economics, Mzumbe University, Tanzania. Niels Fold is a Professor in the Department of Geosciences and Natural Resource Management, University of Copenhagen, Denmark. Arne Henningsen is an Associate Professor in the Department of Food and Resource Economics, University of Copenhagen, Denmark. Marianne Nylandsted Larsen is an Associate Professor in the Department of Geosciences and Natural Resource Management, University of Copenhagen, Denmark.